Achilles tendon ruptures are common injuries that can be quite disabling. They can occur in athletes, as well as those who are sedentary. The ability to walk is significantly limited when the Achilles tendon is ruptured, and full recovery of this injury is often lengthy. 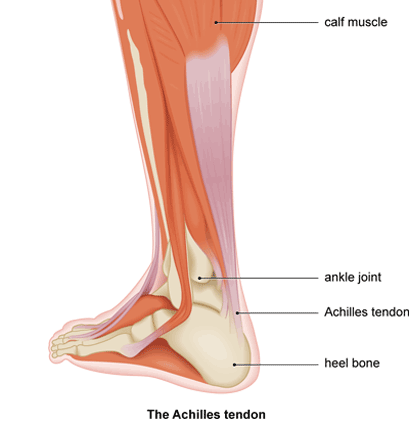 The Achilles tendon is a strong, large, strap-like tissue that connects the two calf muscles to the heel bone, allowing the leg to flex the foot downward. Without this tendon, the foot would uncontrollably flop upward during the walking cycle. Ruptures can occur for a wide variety of reasons. The most common injury occurs during athletic activity, when the foot is flexed upward forcibly while one is pushing downward, or when the back of the heel is forcibly kicked. The Achilles tendon can also rupture when something slices across the back of the heel, like shattering glass or a sharp low-height object. People who take steroids for long periods of time, or who have a steroid injection near the back of the heel are at greater risk of Achilles rupture, as well as those who have rheumatoid arthritis, gout, lupus, and other conditions that weaken collagen tissue. The typical area of rupture occurs at a place above the heel bone where there is poor blood flow to the tendon tissue. A rupture will feel sharp and stabbing, and often a pop or snap is heard. The calf can feel like it has been hit from behind. Walking is extremely difficult, and after the rupture the ability to rise up on the toes is lost. The back of the heel can become swollen and bruised, and there may be a indentation in the heel where the Achilles tendon rupture has formed a gap. Treatment of this serious injury usually involves surgery to repair the severed ends of the tendon together. The sooner the repair can take place, the easier the tendon ends will heal together. Lengthy delays in repair, especially those months in duration, will often lead to scar tissue, tendon degeneration, and a widening of the gap between the severed tendon ends. This makes repair very difficult, and often requires the use of tissue grafting or calf tissue lengthening. Once the ends are stitched together, the foot is held in place within a cast for four to six weeks as the tendon heals. Physical therapy is usually started soon afterwards to restore strength and flexibility. When the rupture only involves part of the tendon, or if age or health precludes one from having surgery, the rupture is treated simply within a cast for up to two months to allow the tendon ends to scar themselves to one another.